It was hard to come back from the future without wanting one of the spectacular concept cars that were displayed like priceless jewels at the Pittsburgh International Auto Show. Throw in a $340,000 Rolls-Royce, or any one of dozens of shiny new cars that looked great because they weren't covered with the salty slime of winter, and car talk turned to car fever Friday at the David L. Lawrence Convention Center. 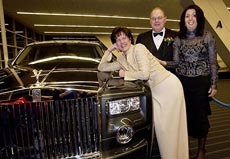 The black-tie preview party hosted by the Pittsburgh Automobile Trade Association is always relaxed fun, and this year proceeds were earmarked for POWER and Family House. As guests strolled among the cars, they could stop at buffets stocked with roast beef, Asian fare, pastas and extravagant desserts, or bid on Valentine jewels from Hardy & Hayes. PATA Charitable Foundation president and auto show co-ordinator David Wagner joined auto show chair David Busha and PATA president Bryan Harhai in welcoming the guests who came and went all night (and leaving was such sweet sorrow with boxes of Krispy Kreme doughnuts as party favors!). A champagne reception attracted all the major car dealers in the region, including brothers Bud and Jim Smail, Rob Cochran with Christina, George Benson, Steve Lamfrom, Robert Wright, Debbie Day Flaherty with Shawn, Gene Larkin, Michael Wolcott, Elda and Bill Numrich, Desa and Richard Voelker, Robert Hollack and many more. POWER supporters included its board chair Suzanne Parks and executive director Rosa Davis, Steelers quarterback Tommy Maddox, Rocky and Jan Bleier, John Buckley, Mike Wagner, Drs. Andrea Fox and Ken Thompson and Louis Lipps. Family House executive director Cynthia Roth (with Dr. Jim Kunkel) and board chair David Lovejoy (with Susie) welcomed board members such as Hoddy and Mary Anne Hanna, Paul and Laurie Singer, Nick and Vange Beldecos, Ralph and Ruth Anne Papa, Philip and Rosanna Spina, Bruce Kaplan and Stan and Kathy Geier. Pennsylvania has the most Slovak-Americans of any state -- some 30 percent of the 797,764 people of Slovak heritage listed in the 2000 census. A good half of that 30 percent are concentrated in Western Pennsylvania, which is why the Slovak Embassy opened an honorary consulate here in 1997. Saturday the Slovak ambassador to the United States, Rastislav Kacer, welcomed 300 guests along with Gov. Ed Rendell to the Second Consular Testimonial Awards Dinner at the Omni William Penn. 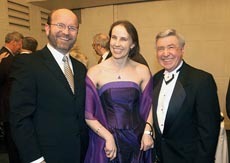 Slovak Ambassador to the U.S. Rastislav Kacer with his wife Otilia Kacerova and Slovak Honorary Consul Joseph Senko. The 2004 Slovak Achievement Awards were given to John Goodish (business), Martin Votruba (education), George Matta II (government), Cecilia Sarocky (lifetime achievement) and Brother's Brother Foundation (accepted by president Luke Hingson) for philanthropy. Enjoying the traditional music being performed by Pajtasi, the only full Slovak folk band on the East Coast, were Honorary Consul Joseph Senko with Albina, City Council president Gene Ricciardi and state Sen. Sean Logan, toastmaster David Blazek with Fran, Stu and Chrissy Mitchell, Susie and Roy Dorrance, Jim and Cindy Capp and Dave and Chris Mayernik.